Recently, the Italian video art festival Magmart initiated a petition to draw attention to the fact that virtually no art museum, art centres or public support schemes in the country assume the task of promoting or subsidising video art. Video art is the Cinderella of the art world – was the rallying cry. And yet, video art has in many ways become an established part of the international art scene during recent decades. But the Cinderalla story shows that what we consider to be the present or the future state of affairs is not necessarily evenly distributed from a geographical point of view. At this year’s FOKUS, we both show the up-and-coming and make room for some of the most outstanding video art that artists of our time have to offer. It is thus with considerable pride that we present the London-based John Akomfrah – an artist with a long and significant production to his name who has not so far been shown on any larger scale in Denmark. Akomfrah’s works contain depth, complexity and powerful poetic statements, and with their focus on migration, identity and remembrance, they address highly contemporary issues. For FOKUS 2016, Akomfrah presents his large video installation Vertigo Sea from 2015 along with a selection of his previous works. 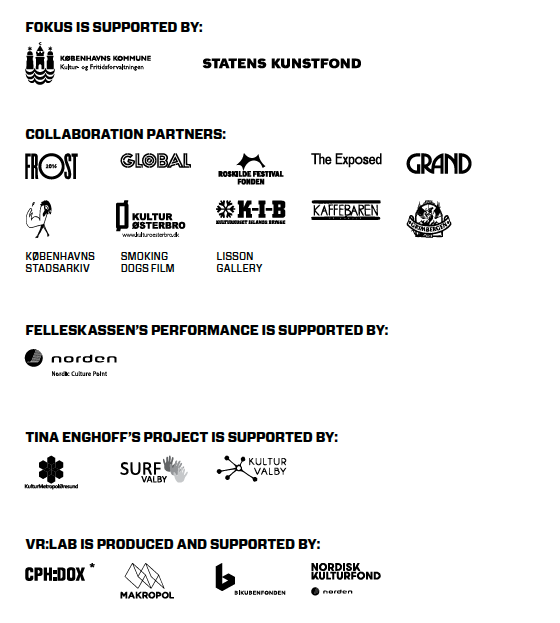 We are also happy to announce that the FOKUS open call this year received 250 newly produced works. The entries are both Danish and international, and together they paint a comprehensive picture of the variety of video art format and where it might be heading. A jury has selected 30 works to be shown for the duration of the festival period, at the end of which the jury will decide which three will be the winners of the FOKUS 2016 open call. At FOKUS 2016, nine VR (Virtual Reality) pieces, challenging the way in which we experience film, will be installed all the way up through the Nikolaj Kunsthal tower. FOKUS welcomes this kind of experiments in which the artistic, psychological and ethical implications of a new medium may be tested, experienced and reflected upon by the public. FOKUS explores the territories between video art and other genres, including electronic music. Together with Frost Festival, Global and the Roskilde Festival Foundation, FOKUS this year invites you to a special evening where Moroccan gnawa music will unite with electronic music and visuals commisioned for the occasion. This year, we show two new productions by Danish artists. A new video by Niels Pugholm will be shown at the reading room of the Copenhagen City Archives, while Nikolaj Kunsthal houses the premiere of Tina Enghoff’s latest work produced in collaboration with residents of the Folehaven residential area of Copenhagen. Norwegian Felleskassen also pays us a visit to conduct a silent movie performance. Finally this year, we will be testing a new way of presenting video art with the printed magazine FOKUS Special Edition, together with an app making it possible to experience 15 video works on your mobile or tablet. Participating artists: Hanna Abrahamsson (SE), John Akomfrah (UK), Viktor-Emil Dupont Billund, Hannah Buckley (GB), Malene Choi, Eva la Cour, Dark Matters, Declinación Magnética (ES), Tina Enghoff, Felleskassen (NO), Søren Thilo Funder, Rafael Guendelman (CL), Selini Halvadaki, Bjørn Erik Haugen (NO), Maalem Omar Hayat (MA) & DJ Rupture (US), Louis Henderson (GB), Elias Heuninck (BE), Duane Hopkins (GB), Lin Li (GB), Nautofon (SE), Nikolai Nekh (PT), Jeppe Rohde Nielsen, Linea Ojala, Other Story, Niels Pugholm, Nanna Rebecca & Pernille Lystlund Matzen, Flemming Rolighed, Anna Samsøe, Luise Sejersen, Malte Starck, Annicken Thrane-Steen (NO), Vladimir Tomic & Ana Pavlovic, Vilje Celin Kern Vestenfor (NO), VR:Lab (Aino Suni, Rikke Tambo Andersen, Alexander Lind, Maximilian Mayrshofer, Calle Holck, Allan Luckow, Camilla Figenschou, Elín Hansdóttir, Birgitte Rask, Frida & Lasse Barkfors, Christian Vangsgaard, Karna Sigurðardóttir, Anna J Ljungmark, Rasmus Kloster Bro, Kristian Kryger, Tobias Gundorff Boesen, Niels Ahlefeldt Wetterberg, Johan Knattrup Jensen og Mads Damsbo).